So, what is mindfulness? In a nutshell, mindfulness is a complete and nonjudgmental awareness of the present moment. “Moment to moment awareness of present events”. Keep in mind, there’s no one agreed upon way of defining mindfulness. This is because it's is a state of being beyond words or concepts. One must practice mindfulness in order to truly understand what mindfulness is. The origin of the word mindfulness is in the Pali word “sati”, and its Sanskrit counterpart “smrti”, which both literally mean “memory”. But perhaps more precisely they represent “presence of mind” or “attentiveness to the present”. This is what the Buddha was referring to when he said, "When we sit, we know we are sitting. When we walk, we know we are walking. When we eat, we know we are eating." He meant that when he and his disciples sat, walked, or ate they were fully present for the act of sitting, walking, or eating. Even when becoming lost in thought, while practicing mindfulness the practitioner is fully aware that they just became lost in a particular thought and are mindful of the thought itself. This is because mindfulness isn’t just mindfulness of an object in the present moment such as one’s breath, steps, or food. It’s also mindfulness of anything which might arise in the present moment while concentrating on an object. In a way, mindfulness is the observer of change. While concentrating on the object of meditation, such as one’s breath or steps, we become distracted by thoughts, feelings, and other sensations. These are “changes” in the field of mindfulness, the area which mindfulness observes. In this way think of mindfulness as a motion detector. If nothing moves, if nothing changes, then nothing is detected. You're still there observing, just as the motion detector which detects no motion is still there observing its area of detection, but until a thought, feeling, or some other sensation arises the practitioner just continues to concentrate on the object of meditation. When this happens is when the real work begins. Mindfulness is a complete and nonjudgmental awareness of the present moment. Think of mindfulness as a “field of attention” with a point of concentration in the center acting as an anchor to the present, rather than just a pointed concentration on something while pushing away everything else around you. Imagine a dream catcher. The idea behind a dream catcher is it’s supposed to “catch” your bad dreams as you’re sleeping. Just as a dream catcher catches your bad dreams, imagine each thought, feeling, and sensation being caught by your “field of mindfulness”. Except in this case, you don’t label any thought, feeling, or sensation either good or bad. While in mindfulness, each thought, feeling, and sensation that arises automatically enters into this field and, this is the important part, is gently acknowledged and accepted “as it is”. By “as it is” I mean without judging it in any way. If this is hard to imagine, don’t worry. For the most part this nonjudgmental awareness happens naturally when you practice correctly. The important thing to remember for now is that mindfulness is not a rejection of anything. Mindfulness is an open acceptance of everything that comes into your awareness. If you’re practicing mindful breathing, don’t reject thoughts that come into your mind just because they interrupt your mindful breathing. Observing these thoughts, which are typically unnoticed but always dispersing our awareness and coloring our perception, is a major part of practicing mindfulness. So this is perfectly fine. Simply acknowledge the thought in mindfulness, just as you were doing with your breath, and then let the thought pass. Then bring your focus back to your breath. As time goes on your ability to concentrate on one point for a period of time as well as your ability to detect things with your mindfulness will improve. And with it, the quality of your mindfulness practice will improve as well. Mindfulness has a number of different “qualities”. It's for this reason that a simple mindfulness definition doesn't really suffice. But, If you break mindfulness down based on these qualities it becomes much easier to understand it as a whole. We’ve covered the basic workings of mindfulness so far, but in order to gain a deeper understanding of mindfulness let’s break it down and look at each quality individually. There’s 6 key aspects of mindfulness which I’ll cover below. Mindfulness is always mindfulness of something. It’s not just a conscious directing of your awareness to the present moment, it’s a conscious directing of your awareness to something which is occurring or existing in the present moment. Common centers of focus are your breath, steps, or some other area or areas of the body. Concentration, or samadhi in Sanskrit, is a force which works in tandem with mindfulness. Concentration is “single-pointedness of mind” and it’s just that- the act of focusing on a single point. While practicing mindfulness, you will be developing your power of concentration as well as your mindfulness. There is no separating mindfulness and concentration. They’re partners on the path to attaining a tranquil and clear mind. Think of concentration as the “hard” force and mindfulness as the “soft”. Concentration is exactly what it sounds like, it’s the forceful act of focusing on a single point. Imagine your field of mindfulness enveloping everything within your perception in a soft glow. Next, imagine a thin line piercing out from your mindfulness directly to an object. This is your concentration. Mindfulness, on the other hand, is a sort of soft awareness. Remember the dream catcher? Mindfulness is the field of awareness which then “sees” everything that arises while concentrating on an object. Mindfulness is what notices when your concentration lapses and your thoughts stray. Think of mindfulness as the ultimate, voiceless, and nonjudgmental observer. It judges nothing. It makes no distinctions. It simply observes everything that comes into its field of awareness. Your concentration, the force anchoring your mindfulness to some object in the present moment (the object of meditation), is the instrument of mindfulness. Mindfulness decides where the point of concentration will be. It observes the anchor point (the point of your concentration), notices when concentration strays, and where it strays to. This might be difficult to imagine at first, but for now just know that the act of practicing mindfulness will feel much like concentrating on an object, such as your breathing, and then doing your best to notice or acknowledge when your thoughts stray. Lose concentration within a few seconds, sometimes aware of the thought or feeling you strayed to, most of the time not. Back to concentrating on your breath. That’s it. But after a while, you’ll begin to notice these thoughts and feelings more often, more clearly, and that will allow you to acknowledge them with your mindfulness. Moving on from the last point, mindfulness is always mindfulness of something in the present moment. If you think hard on this, you'll realize that this goes without saying, because there is nothing but this moment. Any recollection of the past or imagination about the future occurs in the mind, within the present moment. As we spoke about earlier, that can be mindfulness of a thought that arises in the present moment while concentrating on your breath, body or some other object. What mindfulness isn’t is consciouslyreflecting on the past or thinking about the future. When reflecting on the past or thinking about the future, you’re consciously directing your attention to the past, future, or some altogether imagined place. But, you can always be mindful of what arises after contemplating the past or future. In any case, mindfulness is always the observing of what is occurring in the present moment. As we go about our daily lives, we often don’t notice how our perception or mental filters, such as bias, affect how we see the world around us. And we think that what we’re thinking and seeing with our eyes are two different things. But they aren’t. What we see with our eyes passes through our perception before we even realize we see the object. It’s like we have an internal checkpoint which we’ve built up from our life experiences. And this checkpoint has, over the years, gotten filled with both good and bad things which “color” our perception and affect our experiences. In this way, you and your mindfulness are like the house cleaners come to clean up this internal checkpoint and empty it of all those things keeping you from experiencing reality in its true form. Imagine someone offers you a piece of food which you’ve never tried before. This food somewhat resembles, say, Brussels sprouts (bleh!). As soon as you lay eyes on it you have a negative sensation. Maybe you get a bad taste in your mouth, your body cringes a little, and a bad memory of eating Brussels sprouts flashes into your mind. This new food item could be amazing. You have no idea if it is or isn’t. You’ve never actually tried it. But your perception has already completely colored your experience to the point where it can even affect how it will taste. This is an example of how our perception colors everything around us. Everything you perceive is your mind. You might think you’re observing your breath, a Brussels sprout, or a flower. But what you’re really observing is your perception of those things. Mindfulness is about observing what is occurring in the present moment so that you can pierce through perception itself to witness reality as it is without any mental filters getting in the way. This is why mindfulness is mindfulness of something in the present moment. The point of mindfulness is to experience reality as it is, allowing you to touch the true nature of a thing in that moment. Mindfulness is a purposeful directing of your consciousness to the present, it doesn’t happen on accident. To be fully awake to the present moment you have to decide “I am fully awake to this moment” by directing your consciousness to an object in the present moment. You decide to be mindful in any given moment. It doesn’t happen by accident. I mentioned earlier how the point of your concentration, or object of meditation, works as your anchor point to the present moment. The starting point for the anchor and the eventual anchor point is this conscious decision. Think of mindfulness as a ship and you’re the captain. You make the conscious decision to place the anchor down and where to place it. You then throw the anchor, your concentration, off the ship. The anchor then hits the intended anchor point, or object of meditation, where it will rest. Of course, at first, this anchor won’t be very strong. It will be made of, say, plastic. Not a very good anchor. But with time, it will develop into a heavy and resilient anchor. All spiritual practice in an overall sense is about realizing our connection with the ultimate and finding true peace and happiness through accomplishing total liberation (or freedom) from the various factors that hold us back from it. And so we become liberated by discovering the truth. That is, by uncovering all those things which cloud our vision. This is the ultimate purpose of mindfulness. It’s this nonjudgmental awareness that makes mindfulness so important in finding true peace and happiness. Mindfulness accepts everything as it is. As I mentioned earlier it makes no distinctions, holds no bias, and is completely separated from all mental filters which distort your perception of reality. Mindfulness allows you to experience true reality. This is liberation. And as I also mentioned earlier, if you’re not sure how to do this at first then don’t worry. Mindfulness is itself nonjudgmental. It’s helpful to keep this point in mind at times, but you’ll find this will happen somewhat naturally. If you sense bias or get the feeling that you’re somehow coloring your perception of something while practicing then this is a good thing. Simply noticing this is to become mindful of your various mental filters. If this happens, know that you’re on the right path. As always, simply acknowledge it and bring yourself back to your object of meditation. It’s not wrong that you lose your concentration. What’s wrong is not observing the distraction with mindfulness. Mindfulness works like a muscle. At the beginning, your energy of mindfulness will be very weak. But over time, your mindfulness will strengthen and you’ll notice a significant difference both in your ability to concentrate and in your ability to see with mindfulness. This is important to know at the beginning because it’s at the very beginning stages where things are most difficult. While trying to establish the practice of mindfulness as a part of your life, you’ll be constantly fighting old habits. In Buddhism, this is sometimes called “habit energy”. Imagine everything you do carries with it a certain energy. The more you do something the more energy it develops, and with it, the more “pull” it has. You can develop energy anywhere in your life, in both positive and negative places. So when starting out don’t become discouraged when you’re having a hard time sticking to your mindfulness practice, such as when you forget to practice for an entire day altogether. I went through this constantly at first and it’s just part of the challenge. But I promise you that if you just make your best effort, you'll make your way and establish a strong daily practice over time. Most of the time, without us even knowing it, our consciousness is split in many directions. It’s split between various sensations in the present moment and various thoughts in our mind. When sitting at your computer at work, for instance, you could be typing up an email, but really, you’re typing up the email while semi-listening to two people talk a few feet away from you, noticing how cold you are, thinking about that episode of Lost you watched last night, and thinking about the fact that you feel like you’re gaining some weight. That’s really what the “present moment” looks and feels like for most of us: our consciousness, bouncing constantly from one place to another. As you begin practicing mindfulness, you’ll start to observe this very behavior for yourself. This bouncing around makes us live in a way to where we’re only half-awake to anything that occurs around us. Let’s call this life in “standard-definition”. More on this in a bit. The last point I’d like to cover in this chapter is that it’s important for you to know what mindfulness feels like. I can put as many words as I’d like on a page describing how it works, how to do it, the benefits of doing it, and you could read it all, but if I don’t clearly explain how you’ll feel while truly being mindful then you won’t have much more than a guess at whether or not you’re really practicing mindfulness properly or not. So what does mindfulness feel like? In a few words…it feels like turning on the “HD” (High-Definition) switch to your life. By that I mean that the moment you make the conscious decision “I’m now fully aware of what I’m doing and what’s happening to me in the present moment” you should feel as though you’ve come alive. As though, before you made that conscious decision and “activated” your mindfulness, you were half-asleep. With time, you’ll notice things you never noticed before and everything around you will be magnified. Don’t expect the feeling to be that intense at first, though. When you first start practicing the feeling will be subtle, which is all the more reason why one of the first mindfulness practices you adopt should be mindful sitting (traditionally just called sitting meditation, which we’ll cover in Part 2). While sitting quietly in meditation, you’ll make the greatest progress towards improving your concentration and developing your mindfulness, as opposed to doing a more difficult activity before you’ve really developed your skill level. This is because you’ll have fewer distractions and will be able to “hone in” on the feeling I described in the last chapter better. Once you’ve developed your mindfulness though it will be highly beneficial to practice mindfulness of more difficult tasks in order to develop your skill. One last note: Even if you’re just beginning with mindfulness, while you might not be able to tell exactly what thoughts arise in your mind, you should still begin noticing these distractions as they arise. Simply noticing that some sort of distraction just arose in your mind is the second feeling you should look out for, even if at first you don’t know what the thoughts or feelings are exactly. Take these two feelings described together and you’ll have a much clearer picture of what mindfulness should feel like. Use the information I described in this point to guide your practice in the beginning. Breaking down mindfulness into parts helps us understand how it works. But we need to make sure not to make the mistake of actually thinking of mindfulness as a bunch of separate things. Mindfulness is one thing: it’s the conscious act of bringing one’s complete awareness into the present reality, which allows us to see the world in a way we’ve never seen it before- beyond our wrong perceptions (and perception itself), preconceived notions, deep-seated emotions, and beyond the ego. Seeing reality in its purest state, filled with a limitless peace, joy, and freedom. The moment you make the conscious decision “I am going to be fully aware of what I’m doing here and what’s happening to me in the present moment” you should feel as though you’ve come alive. As though, before you made that conscious decision and “activated” your mindfulness, you were half-asleep. FAQ : What’s the difference between mindfulness and meditation? At this point you might be wondering: what exactly is the difference between mindfulness and meditation? Mindfulness is itself a form of meditation. One of various forms of meditation. Which is why, as you might have noticed, the word meditation has been used in place of, or alongside, mindfulness at various points in the book thus far. There’s just certain more traditional ways of referring to different types of mindfulness practices which can often make things confusing for a beginner. Mindful sitting is traditionally called sitting meditation, simply meditation, or more recently mindfulness meditation. Mindful walking is traditionally called walking meditation, not mindful walking. Things like this can make it confusing for someone just starting out, especially someone who’s learning on their own without the guidance of a formal teacher, which is common in the age of the internet. A mental technique characterized by absorption of the mind on an object (either mental or physical) and used to develop or maintain the mind. Like mindfulness, meditation can be defined in a number of ways. What’s important is just that you get the general idea. Your true understanding of meditation will come when you actually begin to meditate. "Mindlessness is the primary cause of our unhappiness. Mindfulness is the cure. " The Buddha considered mindfulness a matter of life and death. Not a matter of whether we'll stay breathing or keel over and die from one day to the next, rather this means that whether you're truly alive and in control of your destiny or not is a matter of mindfulness. Mindfulness gives you back control of your life. When mindless, you're not in complete control of yourself. Your deep-seeded limiting beliefs take control and direct you in a way that attempts to protect the ego. The ego has no concern for our happiness and well-being nor any care for reconciliation with our deep-seeded anger, sadness or any other limiting belief we may have. On top of that, the outside world constantly pulls and pushes you wherever it likes. Life happens, and naturally, your mind reacts to it. That is unless you practice mindfulness. When mindful, you awaken and see through all illusions. You see your limiting beliefs rise to the surface. This allows your body and mind's natural healing process to take effect. Think of mindfulness as your anchor point. The way most of us live our lives, we're physically in one place but mentally in another. We're dispersed between what's actually going on in the present moment, what already happened (past) and what is yet to happen (future). Without even knowing it, we're causing ourselves a lot of pain. We live unreasonably expecting or wanting something other than what's in front of us, we regret what happened in the past even though we have no control over it and then disconnect from what is because the pain of both of those things makes it more enjoyable to live in our imaginations. This is a major cause of unhappiness. This mind dispersion, or mindlessness, heightens stress and anxiety, decreases our productivity, restrains our creativity, disconnects us from the world around us including our loved ones and overall makes us less happy. Instead of being at peace, when we're mindless instead of mindful, our minds are often in chaos. In Buddhism this mind dispersion is referred to as "monkey mind" and is something we've all experienced at one point or another. Some more than others. This is the mind that bounces around from one thought to another uncontrollably. Mindfulness calms our monkey mind by creating an anchor point in the present moment. At first, the monkey mind will resist, but with time you will tame it and gain back full control over your mind. This is the path to true happiness. This is also the major reason mindfulness and mindfulness meditation is so powerful and attractive to us in our modern plugged-in 24/7 world. More than ever it's so easy to live in a mindless, disconnected, state of being. Mindfulness brings us back to ourselves. And it turns out, that's all that we ever needed in order to be happy. Mindfulness is the practice for everyone. Children, adults, men, women, soldiers, athletes, scientists, teachers and everyone in between. It's the most basic practice of peace, happiness and self-healing. And as I'm about to show you, there's a lot of science to back up this point. As if that wasn't enough reason to practice mindfulness, there just so happens to be A LOT of science to back its effectiveness. Below is a list benefits, many stretching beyond what I mentioned above. All of this comes back to the same thing-when we're fully awake to the present moment we become our best selves. Our true selves. I mentioned earlier that mindfulness has become the focus of hundreds of scientific studies. I also mentioned that the results have been so positive that even Wall Street, Silicon Valley as well as medical centers, hospitals and even parts of our education system all across the U.S. have adopted the practice of mindfulness. Mindful eating helps you lose weight and encourages healthier eating habits. Mindfulness boosts our immune system's ability to fight off illness. Mindfulness increases positive emotions and decreases negative emotions (including stress). Mindfulness reduces the effects of Post-Traumatic Stress Disorder (PTSD). Mindfulness increases the density of grey matter in our brains (which is linked to empathy, emotion regulation, learning and memory). Mindfulness makes us more compassionate. (and here). Mindfulness improves our relationships by making us more satisfied, optimistic, relaxed, and accepting of one another. Mindfulness is great for parents and children- it improves our relationships with children, makes us happier with our parenting skills and improves the social skills of those children who practice it with their parents. Mindfulness helps both teachers and students(and here)- Mindfulness reduces student's behavioral problems and aggression and improves happiness levels and their ability to focus. Also, for teachers, mindfulness has shown to lower negative emotions, fight depression, foster compassion and empathy and lower blood pressure. This is the fun part. Now it's time to begin learning how to practice, and feeling the effects of, mindfulness. Before you read through this section and dive into the material though, remember the working mindfulness definition we covered earlier. It will help you initially get into the right mindset for practice. As you go about your day you should begin to closely examine everything you do. Create the habit of "checking" yourself throughout your day. Ask yourself at random points in the day: "Am I here, or somewhere else?". Many times we don't even realize we're not being fully awake to the present moment. Let me give an example. In The Miracle of Mindfulness: An Introduction to the Practice of Meditation, ThichNhatHanh tells a story of how one day he and his friend Jim shared a tangerine under the shade of a tree. Jim began talking about what they would be doing in the future, attractive future projects and the like. You ought to eat the tangerine section you've already taken. If he had been eating anything, he was "eating" his future plans. Why do I tell this story? Because in order to know how we can cultivate mindfulness it helps for us to be able to identifywhen we're not being mindful. This story aptly sums up the way most of us live our lives. Everyone can relate to doing this at some point. We do this on a daily basis and many of us constantly throughout the day. This story does a great job of helping us identify what a lack of mindfulness looks like in our everyday lives. This is a process, it will take time to notice when you're not being mindful and to build the habit of practicing mindfulness throughout your day. But, it's worth it, as you saw from the previous section. This isn't a race, so don't try to do everything at once. Take it one step at a time and you'll begin feeling the effects of mindfulness on your mind and body. Sitting meditation is how most people are introduced to mindfulness. Many think mindfulness is just a form of sitting meditation, but to think so is to greatly misunderstand the purpose and downplay the importance of mindfulness. In order to create new mental habits and condition your mind you need to be mindful throughout your day, not just during meditation. It can be beneficial to think of mindfulness as an extension of your meditation practice and sitting meditation as the foundation. Walking meditation is great because you can do it anywhere and at any time. It's absolutely one of my favorite mindfulness practices and pairs well with being in nature. But, as long as you're walking you can practice walking meditation anywhere. This can be done anywhere and at any time and is really an extension of your meditation practice, yet still it's own distinct technique and worth mentioning here. All you have to do here is pay attention to your in-breath and out-breath. Make sure your breaths are easy, light and even. As you breathe be aware of where you are and what you're doing. Feel the breath coming in and out. Don't attempt to control your breath, just pay attention to it (although your attention on it will calm your breathing somewhat naturally). During this moment, whatever you do, don't lose attention on your breath. Your breath is the most effective tool we have for practicing mindfulness. It's always there with us so it works as the perfect anchor to the present moment. This exercise is great used as an occasional pause button in your day. When you first begin practicing mindfulness you'll have to remind yourself to practice, so pausing a few times throughout the day to do this is perfect as it begins to establish the habit. Other basic activities such as sweeping, doing the dishes, brushing your hair and teeth, gardening, drawing or painting and others can be very nourishing mindfulness activities. These types of activities are much easier to do in mindfulness than, say, having a conversation with someone, which won't be possible until you've built up a certain level of concentration. You can pick to do any of the above activities in mindfulness once you've practiced mindfulness of breath for a bit. Just make sure you do these activities slowly so that you stay in mindfulness from start to finish. Be 100% fully committed to the task at hand. If you're sweeping the floor, sweeping the floor becomes the most important thing in the world. Don't sweep the floor so that you can be prepared with a clean floor for when company comes over later. That isn't sweeping the floor in mindfulness. Sweep the floor to sweep the floor. That is mindfulness. 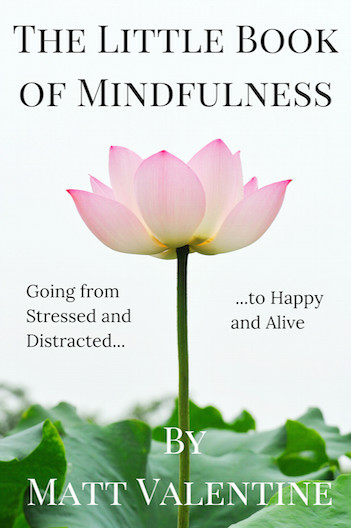 My first book is a complete 130-page A-Z guide on mindfulness that expands on this guide and gives you practical tips and strategies for effectively bringing mindfulness into your everyday life. I hope this guide was able to give you a clear definition of mindfulness and answer the question "what is mindfulness?" fully and completely. If you have any questions about the practice or about mindfulness itself, feel free to contact me here and I'll be more than willing to help. Thanks to Greatergood.berkley.edu for putting together great high-quality articles on the various scientific studies on mindfulness.